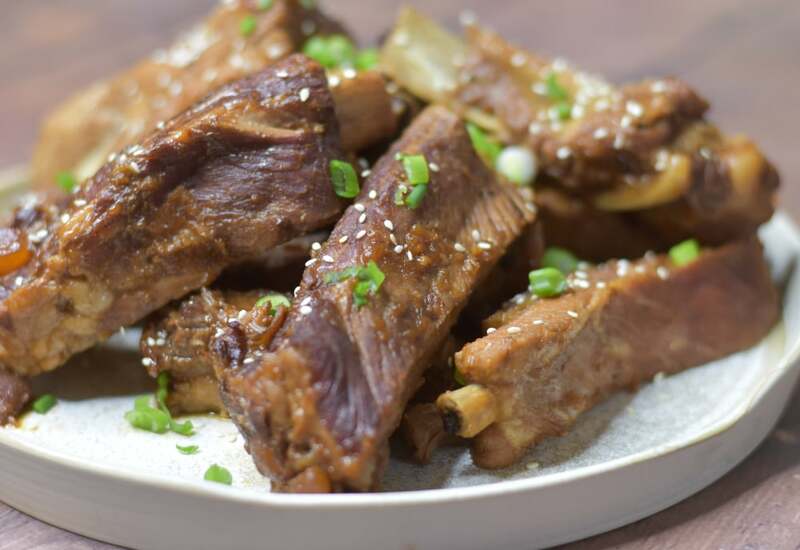 This deliciously marinated soy sauce-based Korean spare ribs will have you asking for more. The grated pear and onion make the pork tender, the flavors blending so well with the added ginger, honey, and sesame oil. Serve this as an appetizer for happy hour at your house or as a crowd-pleasing dish for game day. Rinse spare ribs and submerge in cold water. Whisk soy sauce, ½ cup water, mirin, onion, Korean pear, sugar, garlic, ginger, honey, and sesame oil together in a bowl until marinade is evenly combined. Remove spare ribs from water and place in the inner pot of a pressure cooker; add marinade. Lock pressure cooker lid in place and set steam vent to Sealing. Select Pressure Cook (Manual) and cook for 35 minutes on High Pressure. Allow pressure to release naturally for 10 minutes. Remove spare ribs from pressure cooker and leave 1 inch of liquid in the inner pot. Press Sauté on High. Once it comes to a boil, reduce the heat to Normal. Slice the spare ribs. Place 4 to 5 spare ribs back into the pressure cooker and ladle the liquid on top of the ribs continuously. Continue to ladle the liquid to cover the pork. The sauce will reduce and the pork will become more brown in color. Repeat this step for the remainder of the ribs. Transfer ribs to a serving dish. Garnish the spare ribs with green onion and sesame seeds. The longer you saute the spare ribs, the more depth of flavor will develop as you ladle the liquid on top. You will achieve the most delicious and complex taste as the liquid reduces. This recipe makes the most mouth-watering ribs!! Per Serving: 1924 calories; 132g fat; 36.0g carbohydrates; 149g protein; 567mg cholesterol; 2737mg sodium. The Korean pear really tenderizes the meat in this recipe. Kiwi can also be used in place of the pear if you can't find Korean pear in the grocery. Made the Pressure Cooker Korean Spare Ribs last night, and omg they were amazing! I didn’t have an Asian pear so used a Bosc and a yellow onion. And I omitted the mirin cause I didn’t have it on hand. Served over white rice. My 17 month old loved it too. My only wish was that I made more than 1 rack! A family favorite now! I made this for dinner last week and my husband really enjoyed it. He said to add it to our repeat list, so I know it's good! The marinade for this had a really great in depth flavor that I would be happy to use on other meats. Thanks for the recipe! :) Can't wait to make this again!